Time for some Valentine math with this cool worksheet set. 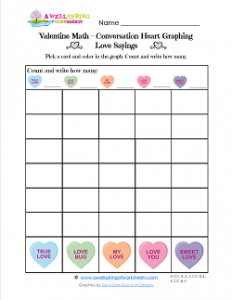 Print the worksheet and each of the pages of conversation hearts. Cut the hearts apart. Give each child a worksheet and count out a number of conversation heart cards, somewhere between 10-20. There are up to six boxes to color in for each of the five colored hearts. Kids color in one box for each colored heart. If you print the worksheets in black and white instead of color, the kids can match the sayings on the cards instead of the color. Count up how many of each heart is colored in and record the number at the top of each column.